Beacon Falls, CT – February 2, 2016 – Two months ago on November 11, a new Lavatec tunnel washer system, complete with extraction press and five drying units, arrived at the central laundry for Eastern Health in St. John's, Newfoundland, Canada. The facility is located in the world's only half-hour Time Zone, on the most easterly edge of North America. Newfoundland is where Leif Eriksson and his Vikings landed over 1,000 years ago, where John Cabot laid claim for England in 1497, where the British settled St. John's harbor in the 1600s, and where the first transatlantic wireless transmission was sent in 1901 from atop Signal Hill, overlooking the Eastern Health facility. The facility itself harbors more than a little history. Built in 1942 during World War II and before transatlantic flights, the building was part of a U.S. Air Force base used to refuel and service aircraft and for crew changes. The structure "is like a bunker," observes Greg Osborne, General Manager of Laundry and Linen Services for Eastern Health. Osborne belongs to Compass Group Canada, a division of global leader Compass Group PLC, which offers support services for customers in 50 countries. With headquarters in Mississauga, Ontario, CGC manages laundry operations for Newfoundland's Eastern Health Authority and provides food service, portering, and environmental services to Eastern Health. The sturdy, 25,000 sq. 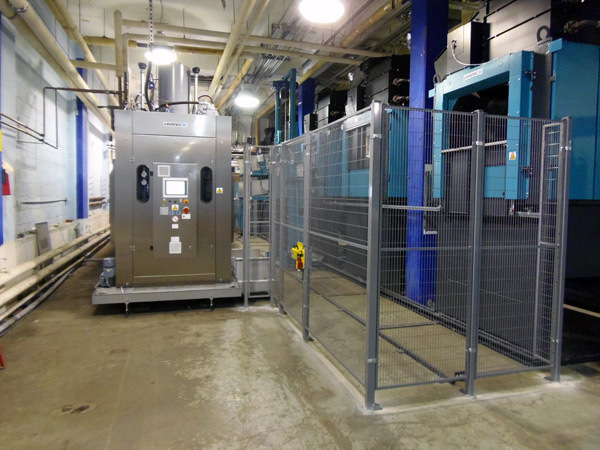 ft. Eastern Health plant provides a suitable setting for the lasting performance of Lavatec equipment: the new 15-chamber tunnel replaces a like-sized Lavatec unit that had logged more than 22 years' service. "The old Lavatec was still operating fine," Osborne reports, "but after two decades, it was reaching the point of needing a major overhaul. Replacement plans were underway when I became GM about two years ago." Eastern Health, one of three regional Newfoundland health authorities, encompasses numerous locations throughout the area, many of which are small clinics and doctors offices. The St. John's laundry services 13 hospitals and long-term care facilities, the furthest being 175 km (110 miles) away. About 85 employees process goods from 7 a.m. to 8:30 p.m., Sunday through Friday, with a swing shift taking over from the morning crew at 4 p.m. They process nearly seven million pounds of linen annually, an increase of over one million pounds a year during Osborne's GM tenure. "Although we are a two-tunnel plant (a 10-chamber Lavatec system was added in 2003), we are the only central laundry in the area," remarks Osborne. 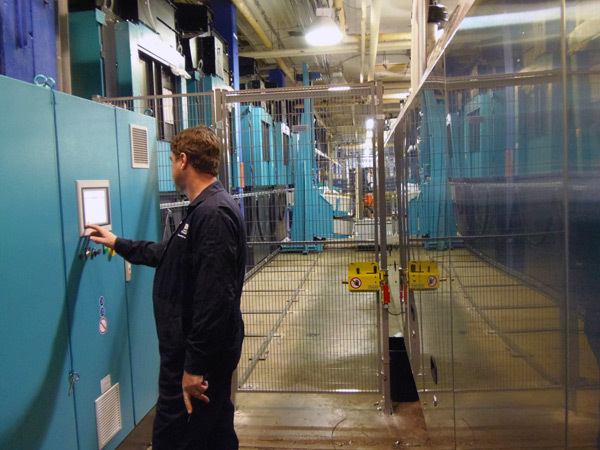 "Since there is no backup laundry, we had to depend on our 10-chamber Lavatec tunnel during the retrofit (replacement) process. We also did a lot of up-front work internally prior to the transition, plus considerable communication with our customers." Two other, smaller Eastern Health laundries, St. Patrick's Mercy Nursing Home in St. John's and Placentia Hospital Laundry in the nearby town of Placentia, also handled some of the load during the retrofit. Osborne notes that the Compass Group Canada management team was very supportive throughout the process, from planning to follow-up activities. Weekly trial runs played a key role in up-front efforts, starting a month before the transition. The 15-chamber washer was essentially shut down and only the 10-chamber tunnel was operated. "This enabled us to work out production or maintenance issues from running just one side, and determine where and when we needed staff. We gained a lot of confidence from these trials, and were well prepared when replacement time arrived." Although the laundry normally is closed on Saturdays, "we brought in staff on a couple of weekends and preprocessed 2 to 3 days' supply, just in case we ran into a snag during transition," says Osborne. Lacking storage space, the linens were packaged and placed on two trucks in the Eastern Health parking lot. "Although this backup supply ultimately wasn't needed, it was better to be safe than sorry." Eastern alerted all health care customers weeks in advance, informing them of the upcoming equipment replacement. Material included FAQs on why the new equipment was being installed and what they could expect. "We also set up a special hot line for customers to call if they were encountering any linen supply issues." Actual decommissioning of the old tunnel started on a Wednesday, timed to allow for out-with-the-old, in-with-the-new activities over the weekend. "We closed the plant from Friday evening through Monday morning," Osborne explains. "This enabled us to focus solely on heavy-duty work with forklifts and cranes, thus avoiding staff safety issues while this was taking place." It worked like a charm. When employees returned on Monday, the new equipment was all in place. "It wasn't functioning," Osborne notes, "but it was safely in-place in the plant, ready for final installation and hookup in the next week." Two technicians from Lavatec and one from its Toronto-based distributor Harco, teamed with local St. John's area contractors who handled most of the electrical, plumbing and related mechanical work. "The local mechanical firm had never before installed a tunnel washer. But they were on top of it and worked well with Lavatec and Harco specialists to properly complete the project on schedule. On November 21, we kicked out our first couple of loads. The next day we went into full production." This included not only the new tunnel washer, but also the new 40-bar LP 572 extraction press and five new steam-heated dryers. The 10-chamber Lavatec tunnel performed admirably throughout the transition, Osborne reports, and the new tunnel picked up the pace without missing a beat. "There are huge reliability advantages with a new system like this," he notes. Lavatec's Laser-Guided Drum Manufacturing, for example, provides tighter tolerances, uniform welds and stronger, tighter, longer-lasting seals – all helping to ensure years of trouble-free performance. Double-drum construction ensures long-term strength and reliability. Maintenance-free friction drives are a definite plus, compared to chain drives in most competitive makes. Lavatec's four-motor drive system keeps laundry moving when one or both motors suddenly require service. More immediately noticeable are advanced tunnel software and controls. "We have lots of new software to work with," Osborne notes, including simple, intuitive compartment-to-compartment monitoring. Reduced water usage is a plus with the new unit, but not a major issue here, according to Osborne. "We don't use meters like most operations in other areas. Water here is plentiful and, by comparison, relatively inexpensive." Like Eastern Health's original tunnel washer, six previous dryers (three Lavatec and three Passat) had logged many years – some since 1985. As a result, "we were drying single loads," Osborne reports, "and a load would take about 25 minutes." The new system includes just five Lavatec steam-heated dryers, which more than match the throughput of their predecessors. 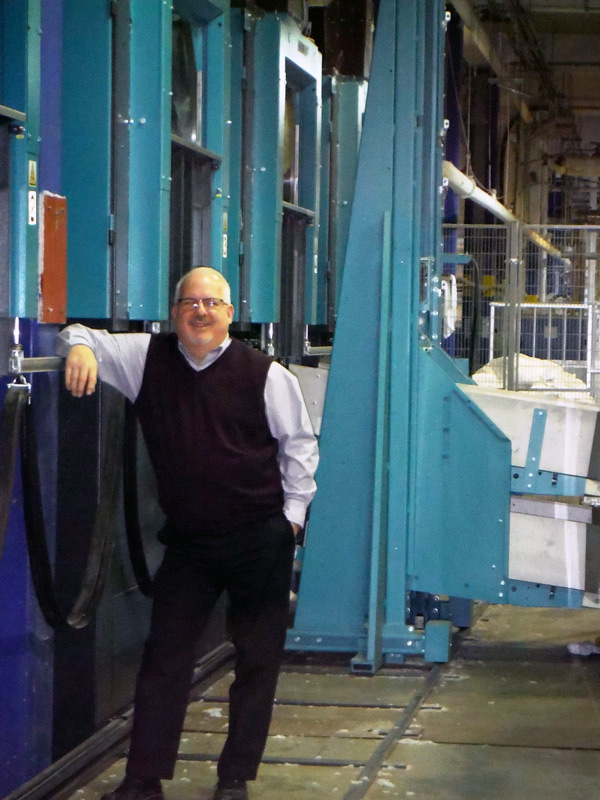 "The new dryers handle double loads in as little as 17 minutes," says Osborne. This equates to nearly three times the total daily output per dryer; a ratio of more than 2.9 to 1 versus the older machines. Granted, the new 40-bar LP 572 extraction press squeezes out more water than Eastern Health's previous unit, before linen cakes go into the dryers. The biggest productivity difference, however, stems from the dryers themselves. Equipped with multiple-phase temperature controls and infrared sensors, they can precisely read each load's progress and deliver the goods as desired. "Infrared technology is already making a difference," Osborne asserts. "There's a whole lot more efficiency now." He also points out that no workers were displaced by going from six to five dryers. "This simply enables us to effectively use more staff elsewhere." Osborne says Eastern Health's mantra, "Together we can," was evident throughout the tunnel system replacement process. "There was tremendous teamwork at all levels. I'm very grateful for everyone's solid participation; this wasn't an easy project but it was made easier with a great team. "We had a lot of cooperation from our staff, hospital customers, contractors, and Lavatec and Harco personnel, enabling us to go into full production with the new system exactly to schedule. What's more, from start to finish during the replacement process, the hot line we set up for customers to call in case they encountered supply issues, never rang." New 15-chamber Lavatec tunnel washer pulls up at the central laundry for Eastern Health Authority in St. John's, Newfoundland. The facility was originally part of a U.S. Air Force complex, built in 1942. Newly installed wash deck at Eastern Health includes a 15-chamber Lavatec tunnel washer, a 40-bar Lavatec LP 572 press and five new Lavatec dryers. The new tunnel replaced a 15-chamber Lavatec with more than 22 years service. Greg Osborne, General Manager of Laundry and Linen Services for Compass Group Canada, credits up-front planning and start-to-finish cooperation for fast, seamless replacement of Eastern Health's entire tunnel system. Simple, intuitive controls and advanced Lavatec tunnel software enable easy full-system monitoring, along with efficient, reliable and low-maintenance performance. Eastern Health processes nearly 7 million pounds of linen annually. 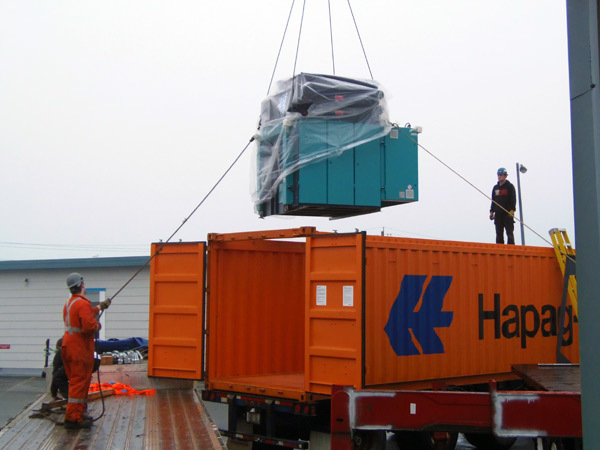 One of five new Lavatec dryers gets a lift into Eastern Health's central laundry. GM Greg Osborne reports that the new dryer quintet, which replaced six previous dryers, finishes double-capacity loads in less time. 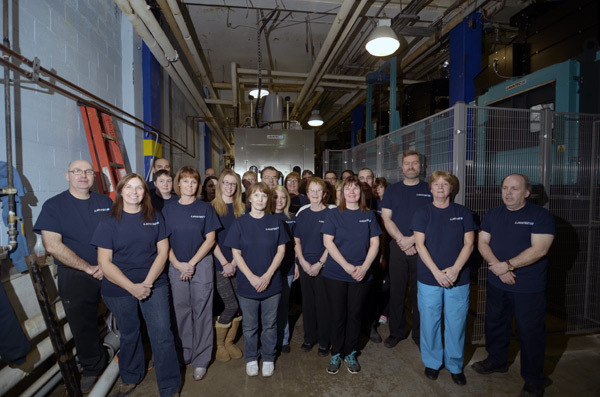 Some of Eastern Health laundry's 85 staff members sport Lavatec-monogrammed T-shirts following installation of the new Lavatec tunnel washer system.